Inky Paws Challenge: Inky Paws #8 Challenge Winners! Inky Paws #08 Challenge - WINNERS! We really had fun a blast checking out all the great entries for our latest Inky Paws Challenge at here at the Newton's Nook Designs blog! This months theme was a diagonal sketch! As always- it's VERY difficult to pick the winners because all the cards are so AMAZING! Thanks to everyone who played along! Our first winner is this cute card by Jess! We loved how she made a "diagonal" of grass for her divider. She also did a great job coloring the raccoon from our Sweetheart Tails Set. You can see more of her work and congratulate Jess on her blog, Basic Jess. Our second winner was this card by Donna! Our favorite part was the paper-pierced boots and umbrella that match the paper on the bottom of the card! Plus the bright colors are great for Spring! Donna used our Spring Showers set. To say hello to her - check out her blog, Creative Lady. Congrats Jess and Donna! Don't forget to send me an e-mail at info@newtonsnookdesigns.com to claim your $10 store credit and get your winner badge for your blog! We really thought this card by Lysa was fun! 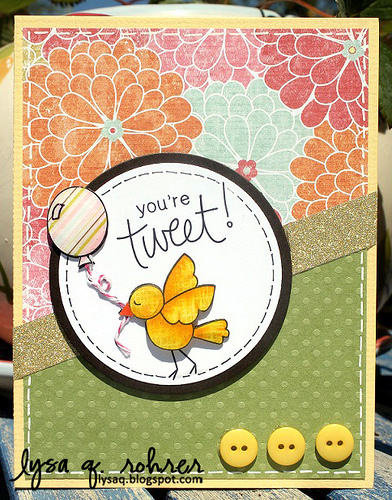 We love how she used the digital freebie bird image and paper pierced it out! And the little row of buttons on the bottom is so cute! The contrast of colors on this card by Kate really caught our eye. We love how she mixed neutral background patterns with the pops of red and yellow! She did a great job coloring that kitty from our Newton's Birthday Bash set too! 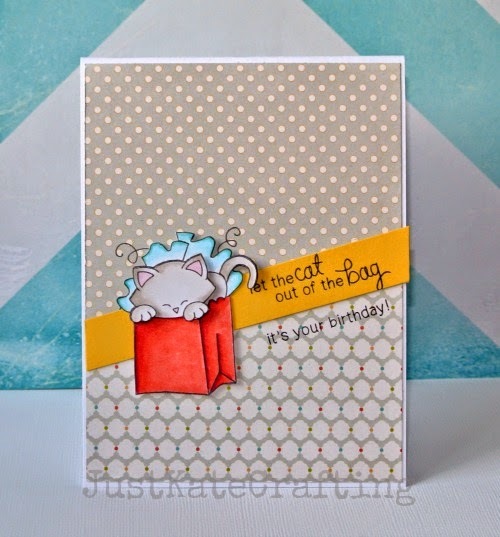 We loved this snuggly kitty card by Kelly! She used the little heart over and over to create her own background for the top of the card -so fun! You can find that heart and the snuggling kitties in our Newton's Antics set.